The MLK holiday is an opportunity to celebrate Dr. Martin Luther King Jr.’s legacy of service and be inspired to live out his legacy today in our homes, our communities and our world. 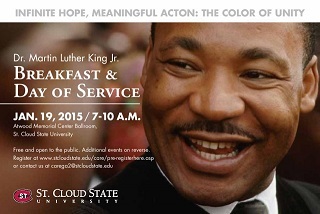 Students are invited to submit an essay or piece of 2D artwork to express their vision of “Infinite hope, meaningful action: The color of unity,” the theme of the 2nd Annual MLK Breakfast on January 19, 2015 at Saint Cloud State University. Visual Art: Create a 2D piece of artwork that visually expresses your interpretation of “Color of Unity”. Award amount: Eight awards at $25 each. Essay: When you hear the phrase, "Color of Unity," what does that mean to you? How can you take action to create unity in our community? Your statement should be up to 200 words. Visual Art: Create a 2D piece of artwork that visually expresses your interpretation of “Color of Unity.” Include a one paragraph statement on the color of unity as well. Award amount: Four awards at $50 each. Essay: When you think about infinite hope and meaningful action, what do you imagine for Saint Cloud as a community? What do you see being different or the same? What are you willing to do to bring your vision of meaningful action into fruition? Your statement should be up to 500 words. Visual Art: Create a 2D piece of artwork that visually expresses your interpretation of “Color of Unity.” Include a half page statement on the color of unity as well. Essay: When you think about infinite hope and meaningful action, what do you imagine for Saint Cloud as a community? What do you see being different or the same? What are you willing to do to bring your vision of meaningful action into fruition? Your statement should be 600 words. Deadline: Thursday, January 15, 2015 at 4:30 p.m.
Submission: Essays are submitted online via the link provided for each age group. Artwork is delivered to C.A.R.E at SCSU South Office Center, 809 4th Ave S, St. Cloud, MN 56301. All 2D mediums welcome. Artwork should be created on paper, unframed and no larger than 11” x 14” in size. Label work on the back with your name, address, phone number, email, school and medium(s) used. Notification: Applicants will be notified of award status on January 17, 2015. The awards will be presented at the SCSU MLK Breakfast on January 19, 2015 in the Atwood Memorial Center Ballroom at 7:00 a.m.
Art Class: K-12 students, if you are interested in a FREE 4 hour art class about artwork of the civil rights movement, self expression thru art and creating a piece for the contest, please contact Sarah Drake at sarahdrakeart@gmail.com. This class is funded by a teaching artist grant from Central MN Arts Board.